At this point in our desert search, we gained as much additional data on the surface conditions as we can. The other factors of access, security, geographic location, local infrastructure, etc., must now be considered to reduce this to a list of sites for Phase 3B – places that we need to go and have a look at. Once an extensive internet search had been conducted, and a number of Land Speed experts consulted about their knowledge of these sites, there were still a lot of unknowns. We tried a couple of large oil and mineral corporations to find out if we could gain any ‘first-hand experience’ from their prospecting teams, but without success. Next was a call to the Director of the Royal Geographical Society, who was kind enough to put me in touch with some experts in deserts. When I finally called Dr Rob Bryant of Sheffield University, I had found the man I was looking for. Rob is a specialist in the subject of desert playas. Full of helpful ideas on how to learn more, he has a first-hand knowledge of many of the sites and, most important of all, was keen to help! Also important for us, he was keen to help to protect the desert environments and was willing to advise on how we could run the Car with the minimum of impact. LSR teams are very fastidious in cleaning up both before and after themselves but we needed advice on which surfaces to avoid altogether for environmental reasons. The main changes as a result of the Phase 2 and 3A work have been the removal of some of the less promising sites. All of the US sites are still on the list (and Tooele Valley popped back in as a late entrant, having initially been dropped due to its very marginal length). 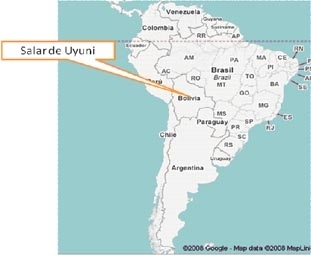 Only one of the South American sites remains, the rest having been dropped due to concerns over surface quality, access and security – we are keeping Salar de Uyunis (right) in reserve (after all, it is the world’s largest salt flat, we can’t ignore it competely!). In Africa, several of the sites are highly protected and would be unlikely to be able to support a prolonged assault on the Land Speed Record, plus all the visitors that would attract. The remaining site in S Africa is Verneuk Pan (left), site of Malcolm Campbell’s record attempts in 1929, and a promising surface for BLOODHOUND. Lake Tuz in Turkey still looks worth a visit, while the Rann of Kutch on the India Pakistan border is not the most stable part of the world but can be kept as a reserve. More work on the Australian sites left us with Lake Eyre (of 1960s Donald Campbell fame), Lake Garidner (Rosco McGlashan, the Australian record breaker’s preferred site) and Lakes Frome and Mackay. With the home study complete, it's time to get out the passsport, GPS and Cone Penetrometer and go desert surveying.